The ongoing globalization requires a modern supply and distribution service. By acting as a premium partner of a global high and heavy network, we at Interfracht are your contact for shipments beyond the normal. 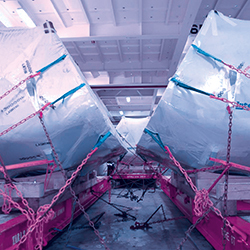 Interfracht arranges high and heavy and project transports by all different carriers. Each movement has its specific needs and requires a careful and detailed route planning. Our team for abnormal loads will work out the most economical solution. We use all modes, by road, by rail, by Waterways and also by charter flights. We are happy to provide you timely delivery of high & heavy cargo. Ro/Ro has been our specialty for over four decades. Here we can offer our world wide contracts. Arranging of special crating, special equipment and customs documentation are only a few of our service items.